Vít Hořejš in A Christmas Carol, Oy! Hanukkah, Merry Kwanzaa. Photo by Tatiana Ronderos. BOTTOM LINE: A fun, quirky, and kid-friendly marionette-theatre adaptation of the Charles Dickens classic. When December rolls around, New York inevitably has a whole array of holiday theatre to offer. From Radio City to the dusty downtown black box theatres, there are shows that can either put you in the Christmas spirit, commiserate with your holiday blues, or make you laugh it all off. A Christmas Carol, Oy! 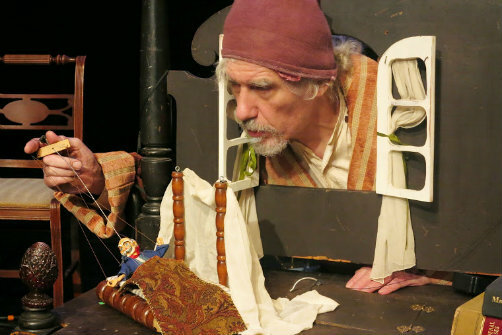 Hanukkah, Merry Kwanzaa, playing at La Mama’s second floor Club, is a fun re-imagining of the Charles Dickens classic, featuring beautifully crafted marionettes (made by Milos Kasal, voiced and operated by Vít Hořejš). The cast of 30 puppets offer a generally straight-forward re-telling of A Christmas Carol. We watch old man Scrooge as the spirits of Christmas past, present, and yet-to-come visit him in the night and show him the ways in which his greedy, grumpy, misanthropic disposition is detrimental to the good people around him. The three “spirit” puppets are particularly impressive pieces of artistry and translate well in a theater that is maybe a touch big for this rather miniature production (suggestion: if you come with kids, arrive early and try to get them places up front, where they can really see the action, sitting on cushions on the floor—maybe not as appealing to those with aging bones, but while the story is easy to follow from anywhere in the theater, the magic of the small scale puppetry is compromised from anywhere beyond the third or fourth row). As the name suggests, this kid-friendly show attempts to weave a sense of multiculturalism into the classic Christmas story. While Hořejš does break from a strict performance of Dickens’ narrative, it mostly comes in the form of wise cracks and contemporary cultural references, the latter of which is more for the parents then the kids. Aside from a few moments, the advertised multiculturalism is mostly kept separate from the story and comes in the form of songs, sung beautifully by Judith Barnes and Hayden DeWitt in English, Czech, Hebrew and Swahili throughout the show. In other words, don’t expect to see Tiny Tim spinning the dreidle or slouching off Christmas in favor of Kwanzaa—A Christmas Carol is altered, not rewritten. As the puppeteer, Hořejš is really the epicenter of the show's universe and his casual and imperfect approach could be interpreted as charming or irritating, depending on the audience member. He forgets lines, drops puppets, and makes other frequent faux pas, but it’s worth noting that those were the moments that most delighted the children in the audience. Overall, A Christmas Carol, Oy! Hanukkah, Merry Kwanzaa strikes me as a great kid-friendly holiday show, one that's especially appealing to parents who want their children to see something a little more of the old world, and that's accessible to children but not without its benignly adult moments. Marionettes are hard to come by these days, but there’s no denying the charm of a puppet on strings, and a puppeteer who knows how to pull those strings. As a bonus, the puppet maker also sells handmade marionettes after the show at very reasonable prices.